NHL News : Flyers sign 14-year-old cancer patient to contract! 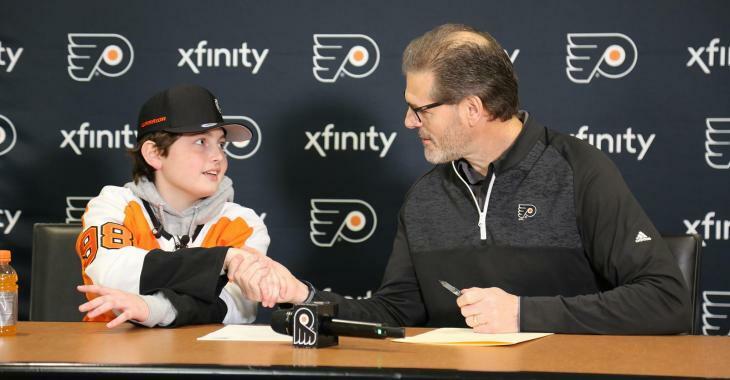 Flyers sign 14-year-old cancer patient to contract! This news will simply melt your heart as the Philadelphia Flyers made one of the most significant signings of the season. On Wednesday, the Flyers signed left wing Luke Rogers to a one-day contract, according to general manager Ron Hextall. Rogers, 14 (5-4, 120 lbs), of Morgansville, N.J., took the ice for Flyers practice on Wednesday, November 14, in advance of Hockey Fights Cancer Night. He will get to take part into the upcoming Flyers Hockey Fights Cancer Night on November 27 at the Wells Fargo Center, when the team will face the Ottawa Senators. The Flyers will get to host him in the locker room for a special pre-game read off of the evening's starting line-ups. Rogers, who skates at the same New Jersey rink James van Riemsdyk played out of as a youth player, joined the Flyers forward on the ice following practice, as well as in the locker room at his own player stall - he has been assigned number 98. The courageous young boy is currently receiving treatment for Acute Lymphoblastic Leukemia at Rutgers Cancer Institute. Upon diagnosis, Rogers had to forgo team play, but he was recently cleared to skate again without contact, which is amazing news. This will surely make your day!